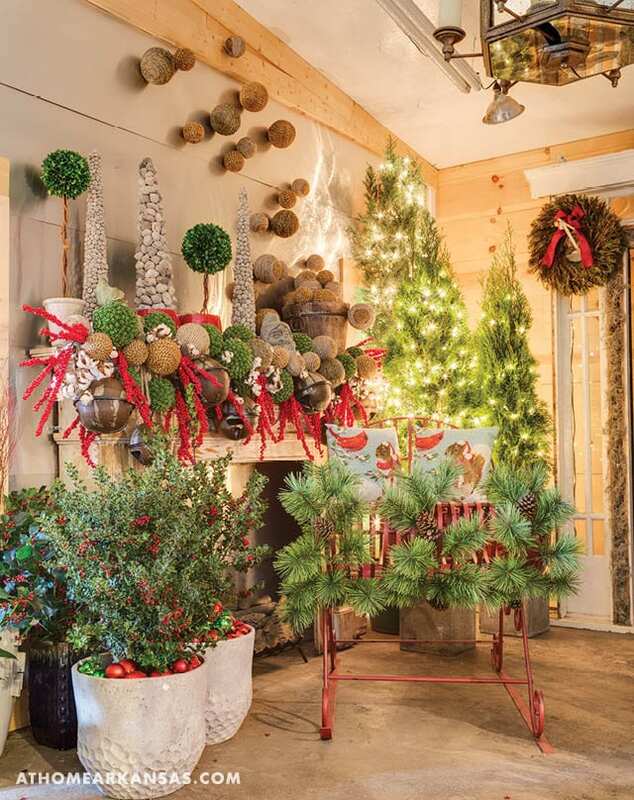 “When it comes to Christmas décor, my philosophy is dare to be different,” Chris H. Olsen says. As a well-known home and garden guru, he puts this principle to practice in his Little Rock shop, Botanica Gardens. For this particular setup, Olsen mixed a few of his holiday favorites with down-to-earth, organic pieces, including volcanic rock topiaries (seen on the mantel), suspended decorative rope balls, and fluffy white cotton, which Olsen says reminds him of snow. “The sleigh is kind of the star of the show,” he notes. “I love that this is a piece that can be used indoors or outdoors.” He suggests adding decorative pillows (as shown here) or using it to display poinsettias. Olsen brings in live plants through the addition of two potted ‘Red Beauty’ holly bushes that help to continue the red-and-green scheme. The bases of these plants are covered with plastic ornaments for added holiday flair. Additionally, a pair of ‘Emerald Green’ arborvitae, potted in square containers, gives the effect of natural, fresh-cut Christmas trees.